Hi everyone. Nothing too exciting going on here lately. We’ve spent the last 2 weeks on Chinese New Year Holiday. Unfortunately, we weren’t able to go anywhere to celebrate…we decided to pay the electricity bill instead. We did take a day to go to a Temple Fair with our small group from Church though. It was a fun time. Jacquelyn will be posting soon to tell you more about that. 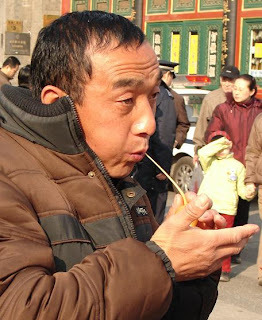 This man in the picture is making New Year’s Pigs by blowing into…well, I don’t really know what it is. 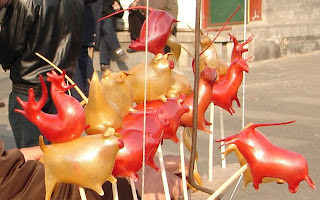 According to the Chinese Zodiac, this year is the year of the Pig. Today I took the last test of my 4th class for my MBA. I believe I’ll have an A for the class. But no rest for the weary…I start my next class tomorrow. This class will be my most challenging by far. It is Economics. Because of the difficulty of the class, I have decided to just take the one class so that I can focus my energy in to it. I did get some productive things done during our break. I’ve been sending out my resume like mad…well, I’ve sent it to four places. And, I’ve already had two interviews! I am very excited at the possibilities. Please keep this in your thoughts.